Benco Dental, dedicated to the distribution of dental supplies, has a large distribution center used mainly for picking operations in the city of Jacksonville, Florida. The installation supplied by Interlake Mecalux has a twin, three-level pick module that includes carton flow and selective pallet racking. Benco Dental is a distributor of dental supplies, equipment, service and technology throughout the United States. The company, which has been in existence for 85 years, is the largest privately owned dental distributor in the country, selling anything from toothpaste and toothbrushes to dental chairs and X-ray machines. The business started out in the northeast with one distribution center and has been branching out ever since. Benco Dental opened one if its main distribution centers in Jacksonville, Florida, in 2002 and since then has added DCs in Fort Wayne, Indiana, Dallas, Texas, and Reno, Nevada. Pick modules have been provided by Interlake Mecalux in each of these locations as well as at Benco Dental's corporate headquarters and distribution center in Pennsylvania. With nearly $750 million in sales in 2017 alone, Benco Dental has been experiencing explosive growth. The company had already expanded its Jacksonville, Florida, distribution center a number of times since moving into the 70,000 ft² building in 2002. While that freed up space in the warehouse, the setup was disjointed and not very efficient. The building featured only a mezzanine over the picking area that had flow rack and some pick shelving on the second floor. 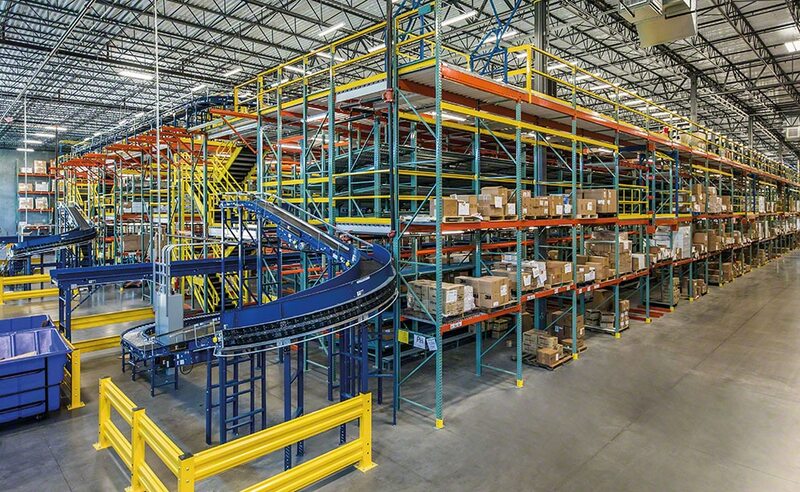 Benco Dental needed a new distribution center to accommodate the 22,000 SKUs it works with and, in turn, carry out picking in an efficient manner. With these constraints in mind, Benco Dental sought the advice of warehouse storage solutions provider Interlake Mecalux in equipping a new 130,000 ft² distribution center only 12 miles away. Benco Dental had already previously worked with Interlake Mecalux on equipping several of its other distribution centers, so they knew they could trust Interlake Mecalux to come up with a viable solution. The first and second levels of the pick modules contain carton flow racking, which has slightly inclined wheel and roller platforms. Operators deposit goods on the high end of the rack allowing gravity to pull the products down to the far end, positioned at the exit aisle, creating a first-in, first-out picking system. There are different zones throughout the pick module. Orders start out on the second floor and travel to the different zones via a conveyor circuit. The 200’ long, 126’ wide, 21’ high pick module allows the preparation of products in the three walkway levels, all linked together by the conveyor circuit. The circuit crosses each of the floors down the center and in front of the carton flow storage racks and moves the merchandise to the checking and packing area. The operators, working by zones, use the tables placed on both sides of the circuit to prepare the orders with the products they collect from the shelves. Once the order is complete, the operator deposits the tote in the central circuit so that it reaches the next zone, where another operator will repeat the same process. The top elevation was designed as a fully decked "dance floor" to support a small refrigeration unit as well as static shelving for hand picking. Access to the different walkway levels is available via strategically located staircases that prioritize accessibility and maximum safety of both the installation and the operators. The pick module also features a fully decked bridge to a mezzanine. In addition, the second elevated level has pivot gates on each corner that are strategically located to support the hand pick shelving on the top elevation. There also are pallet racks to store reserve goods used for picking. The rack assembly offers a storage capacity of 2,880 pallets. Each block of pallet racking is 26’ high and has four storage levels at two 40” x 48” pallets per level. Space optimization: Benco Dental has taken advantage of the height of its new building by implementing twin pick modules with three floors. Increased productivity: by installing the three-story pick module, Benco Dental has been able to streamline picking. Greater efficiency: Benco Dental has been able to improve process flows with a more organized layout. Diversity: installed solutions enable the storage of a wide variety of products of different weights and dimensions.